A new paper published in the European Geosciences Union journal Biogeosciences reconstructs sea ice coverage in the Beaufort Sea of the Canadian Arctic over the past 150 years and finds modern sea ice coverage [9.4 months per year] is significantly greater than during the period from ~ 1887-1945 [8.3 months per year]. Figure 4 of the paper shows modern sea ice coverage is amongst the highest levels of the entire 150 year record. The authors find that the reduced sea ice coverage from ~1887-1945 corresponded with reconstructed sea surface temperatures that were up to 3C warmer from 1885-1935 in comparison to the average modern temperature. According to the paper, sea ice coverage was dominated by natural variation from the Pacific Decadal Oscillation [PDO] and Arctic Oscillation [AO]. Summer SST [sea surface temperature] reconstructions (Fig. 6c) are characterised by a decreasing trend between ∼ AD 1855–1960 and reconstructed SST between ∼ AD 1885–1935 are warmer by up to 3◦C with respect to the average modern temperature at the coring site which is ∼ 4.1◦C. During ∼ AD 1935–1975 reconstructed SSTs are ∼ 1◦C below the modern value. Within the next 10 yr, the temperature increases up to 5.4◦C (∼ 1987) and gradually decreases towards the modern value of 4.1◦C. A decrease in SIC characterises the period AD 1975–1995, with an average value of 7.6 months yr−1, which is 1.8 months yr−1 below the modern value. Sea ice cover duration then gradually increases toward the modern value. All above reconstructed values are within or very close to the conﬁdence limits of the method. Sea ice coverage in months per year is shown in the 3rd graph from the left. Modern average sea ice coverage is shown at the top and is amongst the highest values of the entire 150 year record. Abstract. Dinoflagellate cyst (dinocyst) assemblages have been widely used over the Arctic Ocean to reconstruct sea-surface parameters on a quantitative basis. Such reconstructions provide insights into the role of anthropogenic vs natural forcings in the actual climatic trend. Here, we present the palynological analysis of a dated 36 cm-long core collected from the Mackenzie Trough in the Canadian Beaufort Sea. Dinocyst assemblages were used to quantitatively reconstruct the evolution of sea-surface conditions (temperature, salinity, sea ice) and freshwater palynomorphs fluxes were used as local paleo-river discharge indicators over the last ~ 150 yr. Dinocyst assemblages are dominated by autotrophic taxa (68 to 96%). Cyst of Pentapharsodinium dalei is the dominant species throughout most of the core, except at the top where the assemblages are dominated by Operculodinium centrocarpum. Quantitative reconstructions of sea-surface parameters display a series of relatively warm, lower sea ice and saline episodes in surface waters, alternately with relatively cool and low salinity episodes. 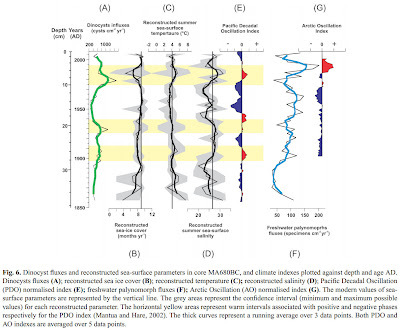 Variations of dinocyst fluxes and reconstructed sea-surface conditions may be closely linked to large scale atmospheric circulation patterns such as the Pacific Decadal Oscillation (PDO) and to a lesser degree, the Arctic Oscillation (AO). 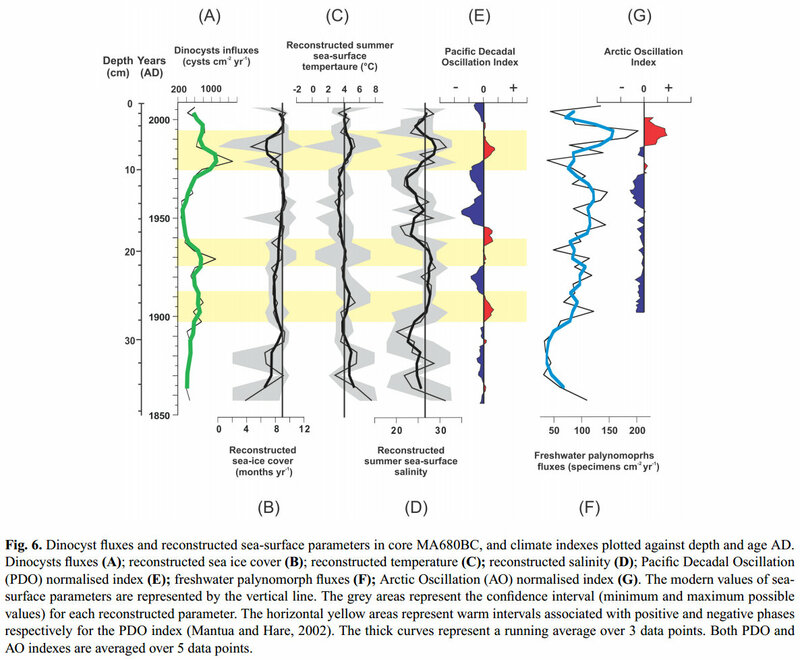 Positive phases of the PDO correspond to increases of dinocyst fluxes, warmer and saltier surface waters, which we associate with upwelling events of warm and relatively saline water from Pacific origin. Freshwater palynomorph fluxes increased in three phases from AD 1857 until reaching maximum values in AD 1991, suggesting that the Mackenzie River discharge followed the same trend when its discharge peaked between AD 1989 and AD 1992. The PDO mode seems to dominate the climatic variations at multi-annual to decadal timescales in the western Canadian Arctic and Beaufort Sea areas. "reconstructed sea-surface conditions may be closely linked to large scale atmospheric circulation patterns such as the Pacific Decadal Oscillation (PDO) and to a lesser degree, the Arctic Oscillation (AO). " I have been saying for years now that climate zone positioning is driven by an interplay between bottom up oceanic forcing (PDO et al) and top down solar forcing (via AO and AAO). Nice to see accumulating data in support. Another research project that suggests a) regional differences can be both significant and not reflective of global differences and b) a 180* at least partial interpretation of similar data.